Stitch 8 arcs of Cable Stitches between the other flower stems using a light/medium green thread and a size 3 or 4 embroidery needle. Stitch a Sheaf Stitch on the tip of each Cable Stitch flower stem using yellow thread and a size 3 or 4 embroidery needle. 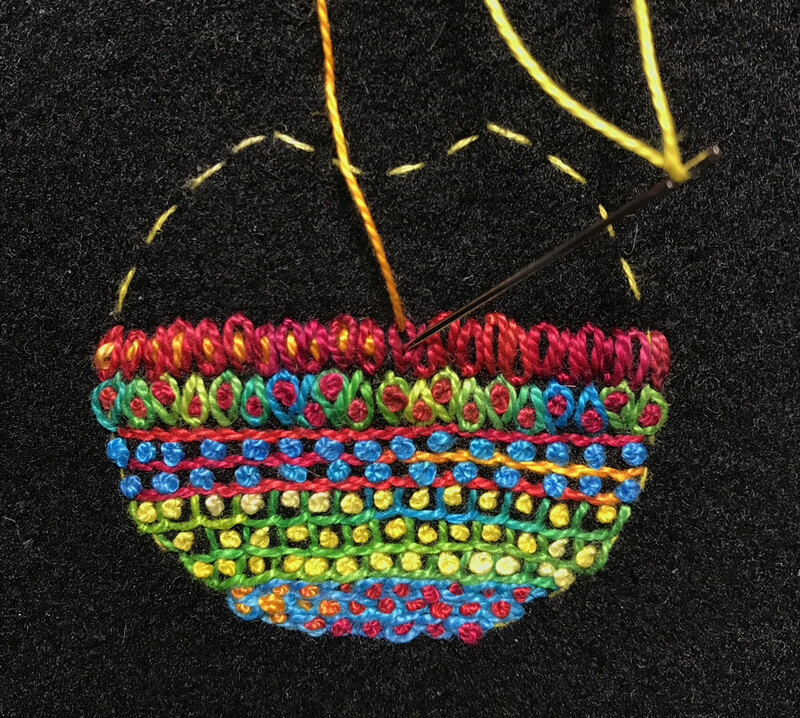 Stitch a French Knot in the center of each Sheaf Stitch using a blue thread and a size 3 or 4 embroidery needle. Stitch rows of Chain Stitches across the fabric to within 1/4″ of the side edges and down to the bottom of the fabric to make the table. 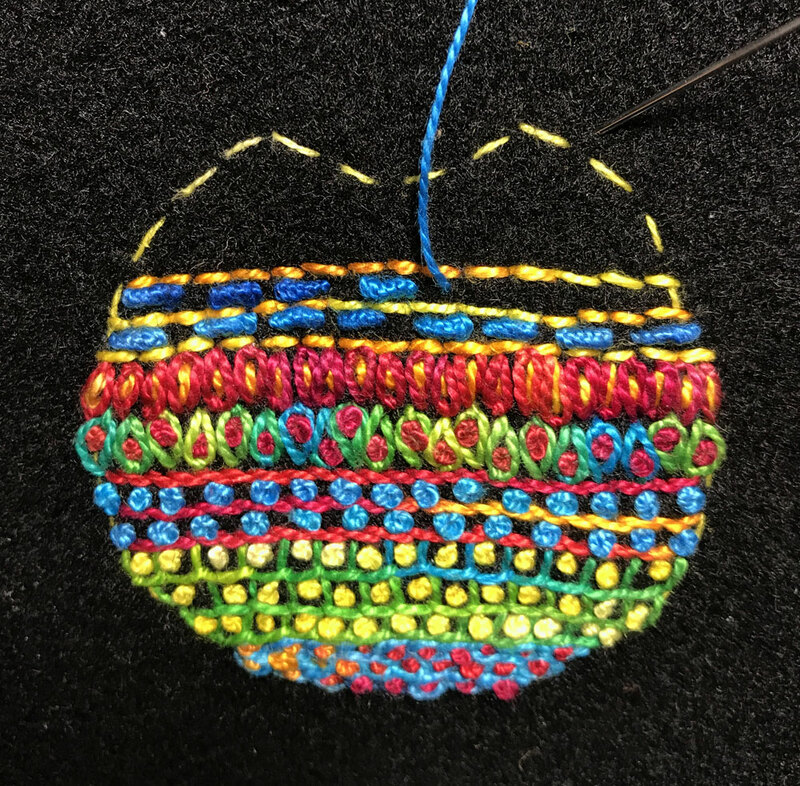 Begin the top row of Chain Stitches where the top of the Blanket Stitch and French Knot rows appear on the vase. Use a red thread and a size 3 or 4 embroidery needle. Stitch 2 rows of Chain Stitches around the fabric to within 1/4″ of the side and top edges to make the borders. Use a red thread and a size 3 or 4 embroidery needle. Trim the outside edges of the fabric close to the Chain Stitched borders. Thank you for visiting with me while we made this colorful vase of flowers. 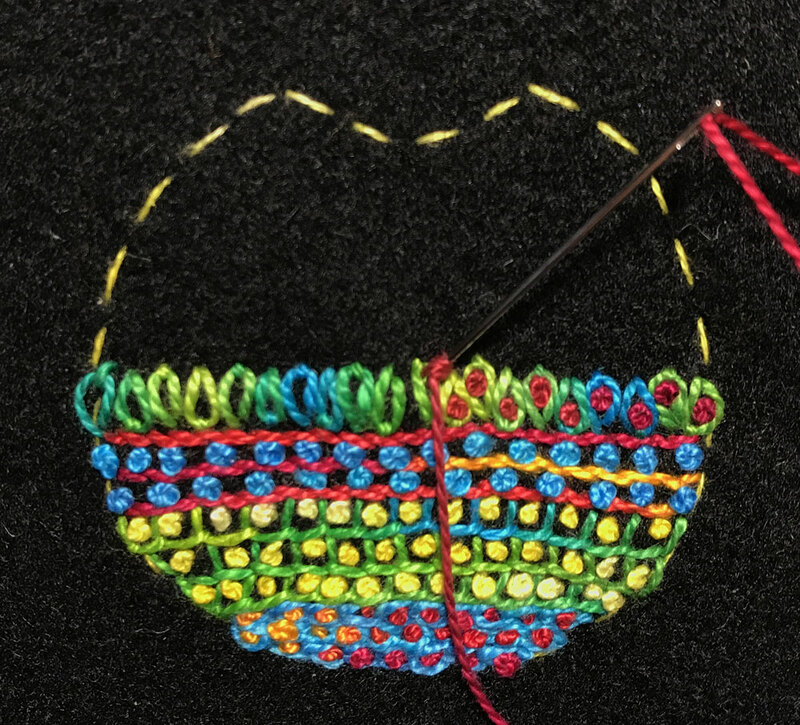 You can find directions for the entire Flower Vase Stitch Along here. Check out more Tutorials here. Stitch a Lazy Daisy Stitch about 3″ up from the center of the rim of the vase using a light/medium green thread and a size 3 or 4 embroidery needle. Using that same thread, stitch a line of Fern Stitches down into the previous stitches to make a center flower stem. Stitch Fly Stitches on either side of the Fern Stitch line to make flowers. Use a red thread and a size 3 or 4 embroidery needle. Stitch a Straight Stitch inside the loop of the top Lazy Daisy Stitch using a yellow thread and size 3 or 4 embroidery needle. 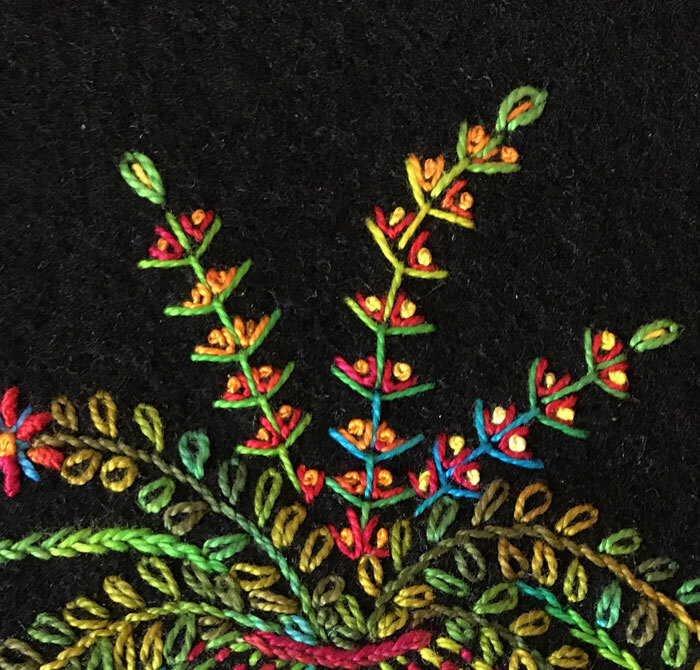 Using that same thread, stitch French Knots inside of each flower. Repeat the above steps to make 2 more flower stems on either side of the first stem. Stitch 4 lines of Stem Stitches arcing out of the vase to make stems. Use a medium/dark green thread and a size 3 or 4 embroidery needle. Stitch Lazy Daisy Stitches on either side of each stem to make leaves. Stitch Ermine Stitches on the ends of stem to make a flower. Use a blue thread and a size 3 or 4 embroidery needle. Stitch French Knots in the center of each Ermine Stitch. Use a yellow thread and a size 3 or 4 embroidery needle. Stitch Bullion Knots between each spike of the Ermine Stitch. Stitch 3 rows of Back Stitches across the vase to make a band of stitches above the previously stitched rows. Space the rows about 1/8″ apart. Fill the rows made by the Back Stitches with Bullion Knots. Use blue thread and a size 3 or 4 embroidery needle. Stitch rows of Running Stitches curving up from the last band of stitches to the top of the vase shape. 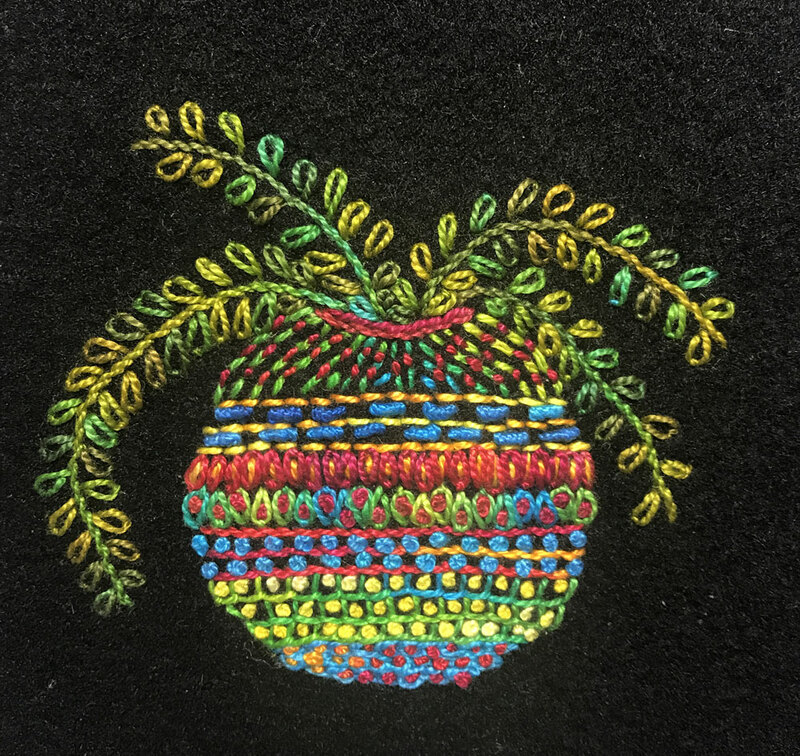 Use light/medium green thread and a size 3 or 4 embroidery needle. 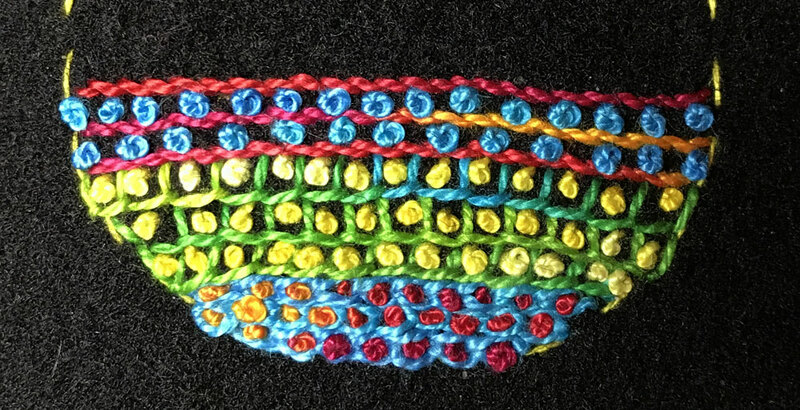 Fill the previous rows of Running Stitches with more Running Stitches. Use red thread and a size 3 or 4 embroidery needle. Stitch 2 rows of Stem Stitches across the top of the vase to make the rim. 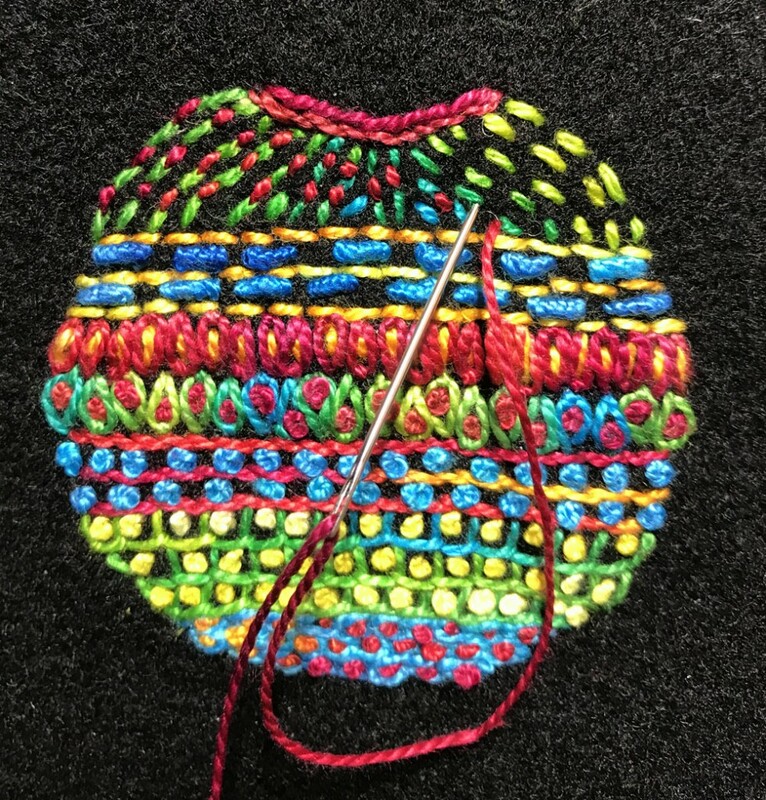 Remove the Running Stitches used to outline the vase shape on the wool. Stitch a row of the Lazy Daisy Stitches across the vase to make a band of stitches above the previously stitched rows. Alternate the stitch so the loop or rounded end is facing up then facing down. 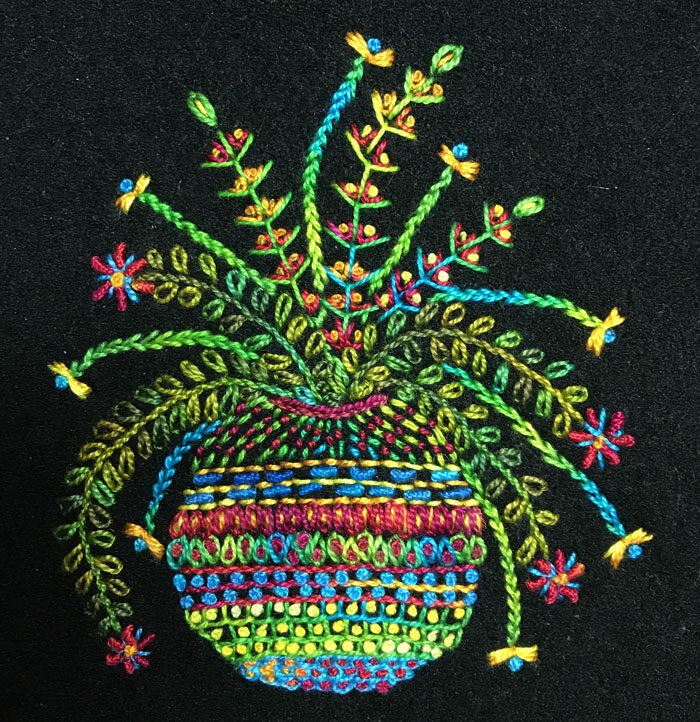 Fill in each loop made by the Lazy Daisy Stitches with French Knots. 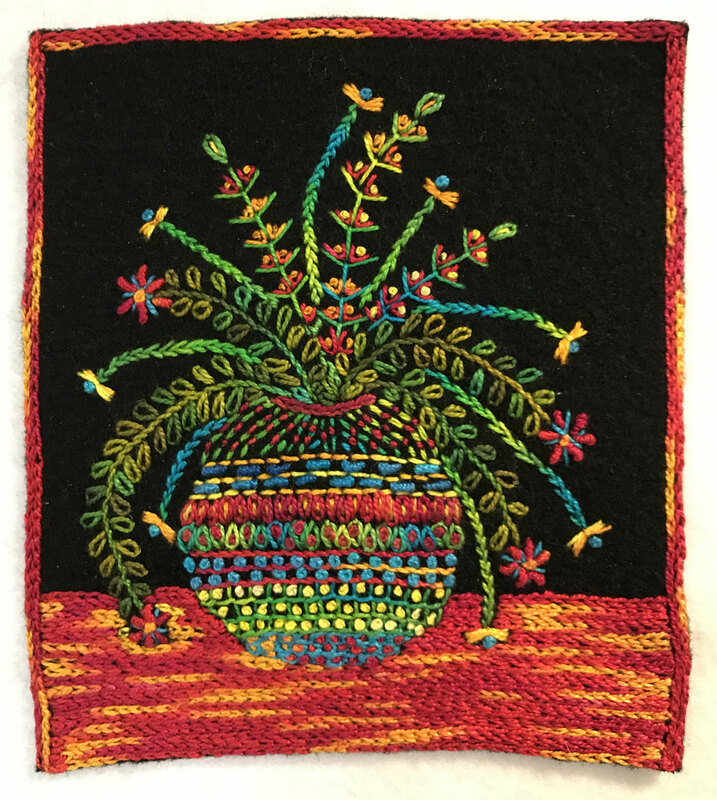 Stitch a second row of the Lazy Daisy Stitches across the vase to make a band of stitches above the previously stitched rows. Use yellow thread and a size 3 or 4 embroidery needle. Stitch 3 rows of Blanket Stitches across the vase to make a band of stitches above the previously stitched rows. Stitch the rows closely together to make little boxes of thread. Fill in each box made by the Blanket Stitches with French Knots. Stitch 3 rows of Stem Stitches across the vase to make a band of stitches above the previously stitched rows. Use red thread thread and a size 3 or 4 embroidery needle. Fill in the rows made by the Stem Stitches with French Knots. 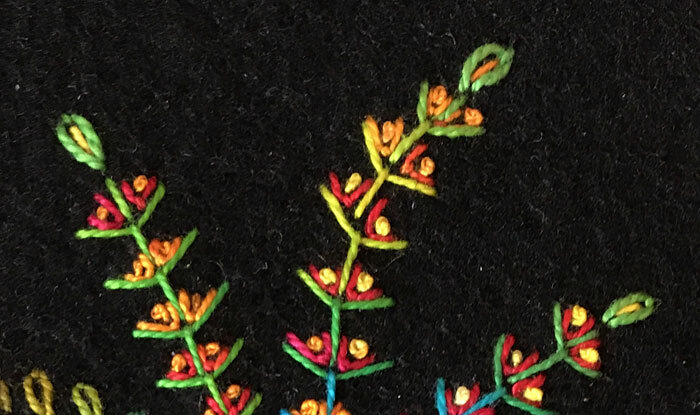 Don’t you love how the French Knot adds that wonderful accent to each stitch combination? Subscribe here to receive notification of new blog posts by Laura. Click on Profile.